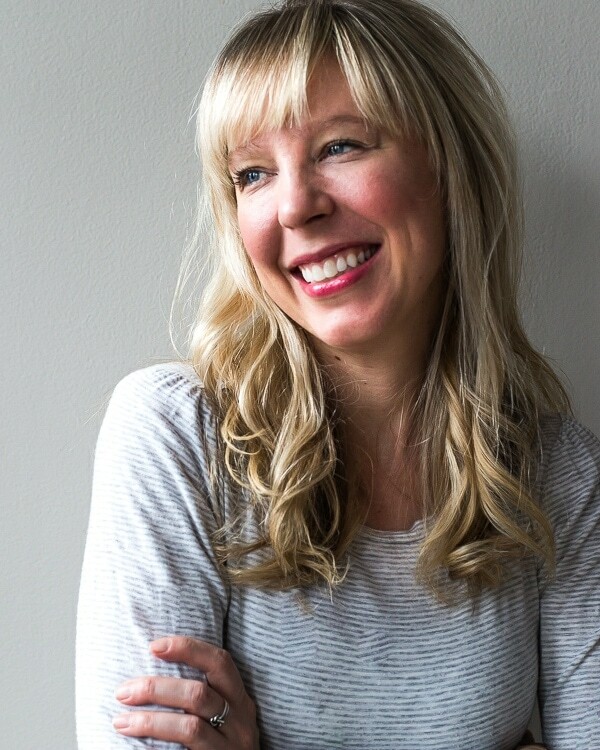 A few months ago, an email popped into my inbox from my lovely friend Sara of Cake Over Steak. We’ve known each other via this digital space for about two years, after I stumbled upon one of her beautiful food illustrations. She is incredibly talented, and as humble and genuine as they come. Seeing her name, I opened the email with excitement, not even taking a moment to glance at the subject line. Well that was an invitation I couldn’t say no to. My vision was to put a vibrant spin on one of my favorite Thanksgiving side dishes, mashed potatoes. 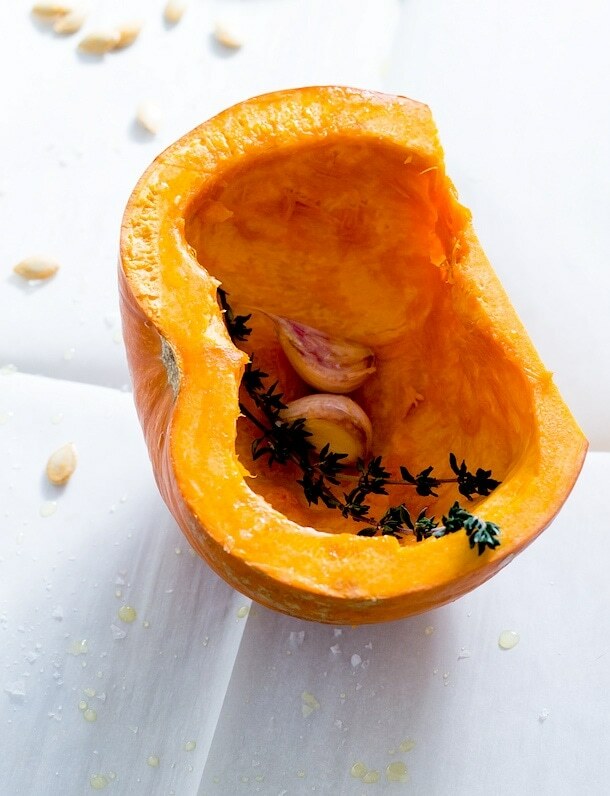 The pumpkin roasts cut-side down as to encase the garlic and thyme, infusing the earthy flesh with deep flavor. Then it’s pureed, and swirled throughout rustic, buttery mashed potatoes. 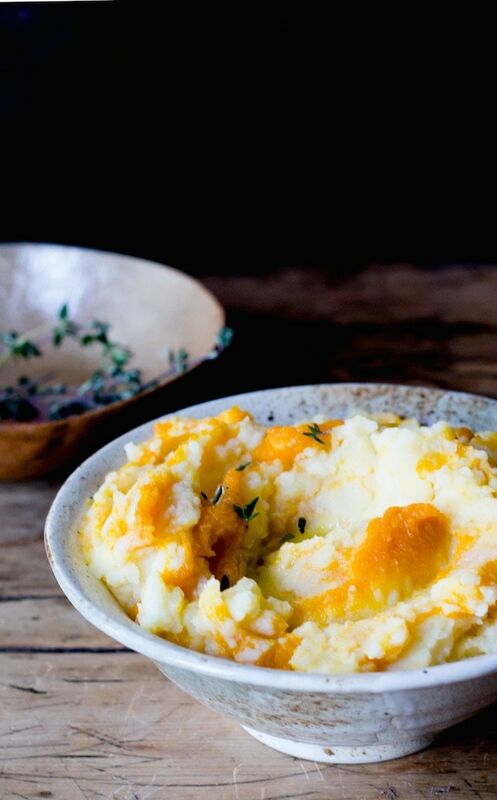 And can we take a few minutes to talk about what makes really good mashed potatoes? My grandmother always used russets, but after a few rounds of testing, I am on team Yukon Gold. They’re naturally a little sweet, and lend themselves to a rustic, creamy texture rather than fluffy. 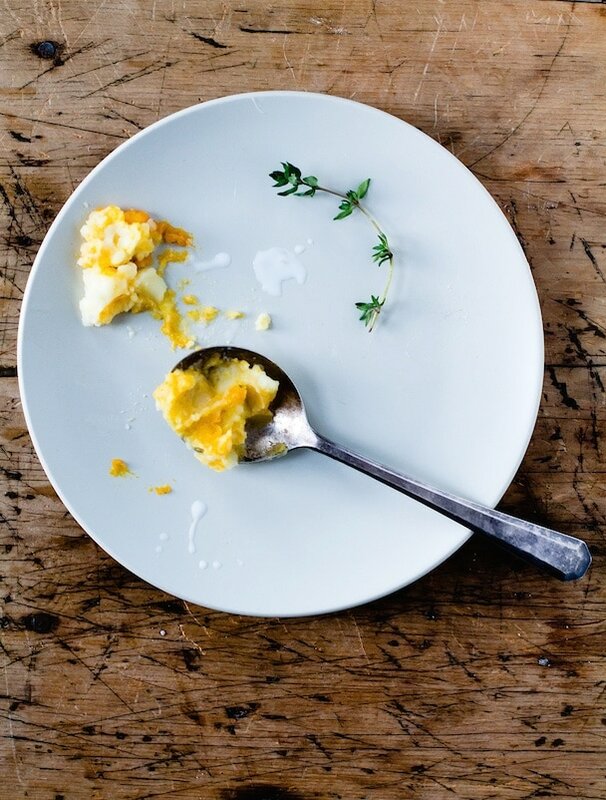 Don’t hesitate buying the best (grassfed) butter you can afford for this dish. And although you might second guess my choice of buttermilk over cream, trust me when I say it’s the secret to the very best potatoes. Even Ina Garten thinks so. Preheat oven to 375 degrees. Cut pumpkin in half and deseed, rubbing clean flesh with 1 tablespoon olive oil. Rub garlic and thyme with a ½ tablespoon oil, then place them on the baking sheet and cover them with one pumpkin halve. Place the other pumpkin halve cut side down next to it. (You probably won't need this half because you should get enough meat from the one with the garlic, etc.) Roast for 40 minutes, or until flesh of pumpkin is completely soft. Let cool, so you can handle, then scrape flesh out of the halve that was covering the garlic & thyme. Measure out 1¼ cups flesh, then add to a food processor. Remove papery skin from garlic and discard, and also take thyme leaves off the sprigs. Add garlic & thyme leaves, plus remaining ½ tablespoon oil to food processor and blend all until smooth (add a tablespoon of water if needed to become smooth). 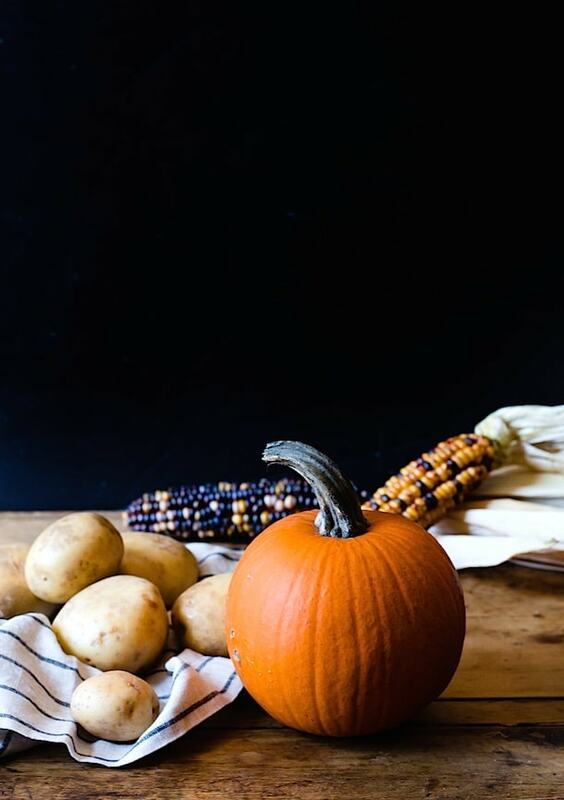 While pumpkin is roasting, place potatoes and 1 teaspoon salt in large saucepan; cover with cold water. Bring to boil, reduce heat to medium, and simmer until tender, about 25 minutes. Drain well, reserving 1 cup of the cooking water. Then return potatoes to to pot. Mash potatoes until somewhat smooth, then stir butter into them. Add warm milk and continue lightly mashing until absorbed. Add ½ cup of cooking water, and incorporate. (You can add more if you like them smoother, and continue mashing. The texture part of this recipe is all up to you!) Season with remaining 1 teaspoon salt, garlic powder and black pepper. Using a spoon, add pumpkin mixture at once to mashed potatoes and fold in, creating swirls throughout. Serve warm. 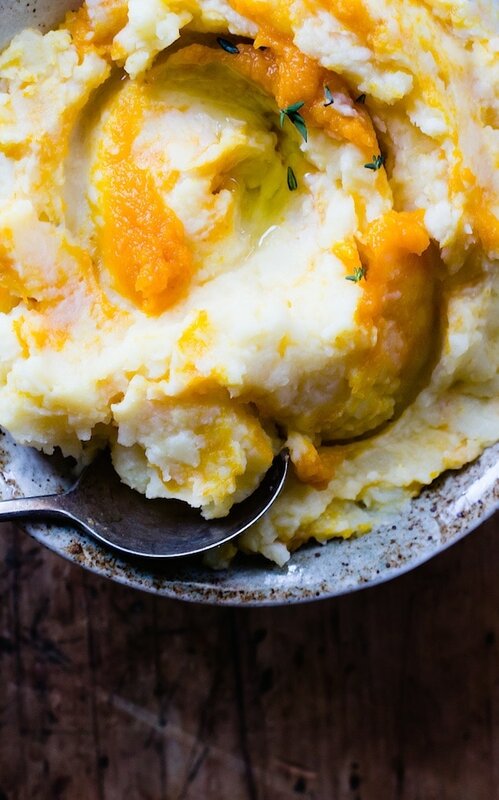 I adore mashed potatoes, so adding pumpkin is just making me love these even more! Gorgeous pictures Amanda. Hopefully one day soon we can all share a meal together in person, eek! 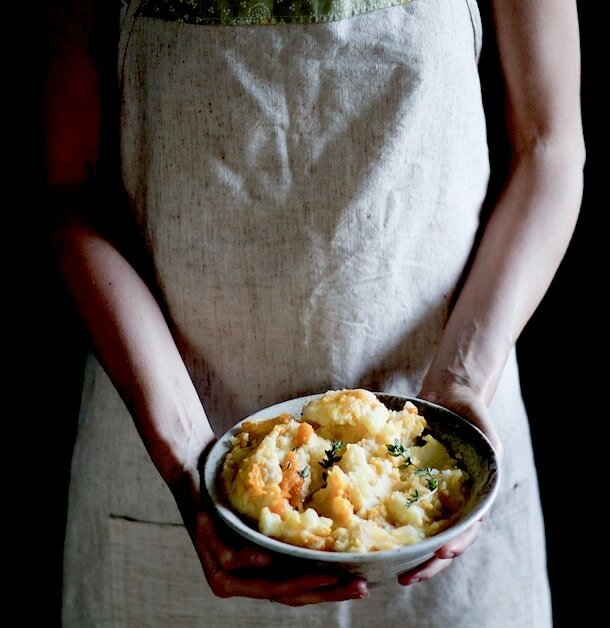 I’ve kind of fallen off the mashed potato bandwagon, but this recipe brought me right back! That roasted garlic and thyme scented pumpkin puree with the butter and potatoes -yeah so good! 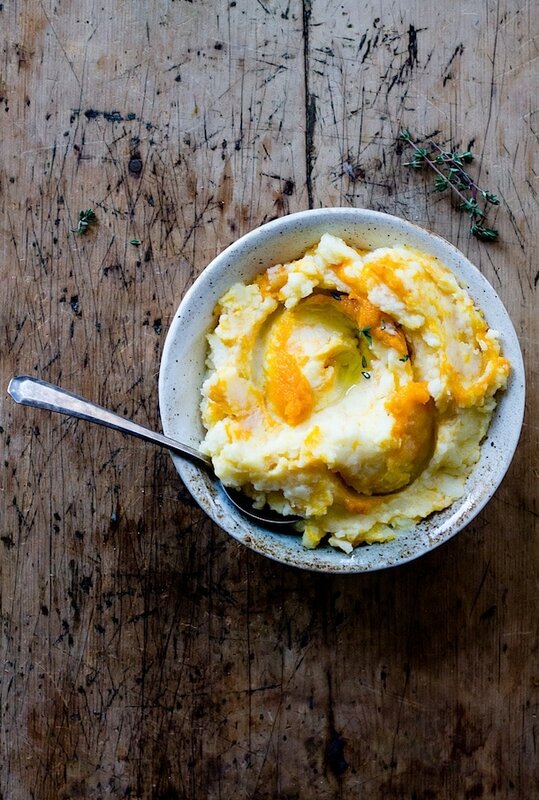 I literally want to dive into that big bowl of swirled pumpkin mashed potato goodness! Beautiful photos and such a comforting recipe! loooove. this is a really creative use for pumpkin and it totally reminds me of my family’s thanksgiving dinners when we serve mashed butternut squash, mashed rutabaga, and mashed potatoes together on a plate where they inevitably swirl into a beautiful mess. These are spectacular!!! I love the swirl of colors and I bet they taste incredible too. Happy Pumpkin Party!! :D I’m in love with the swirl of the mashed potato / pumpkin, it looks so beautiful!! A virtual pumpkin party! That sounds like so much fun! I love that you’re bringing these mashed taters with a bit of pumpkin in it! Wow Amanda, you are doing brilliantly with all your reintroductions – this looks delicious! Ohhh girl, I really wish you were able to make it to this weekend’s brunch and could bring these potatoes! I’m drooling. Like, seriously. i know – so sad i can’t be there! we’ll have to catch up soon. Oh. My. God. I need a huge bowl of this pumpkin potato goodness right now. I think this might be the most inviting comfort food I’ve ever seen. GIMME! :) wish we could have a whole pumpkin feast together! Oh my gosh what a great idea. This would be beautiful on a Thanksgiving table! 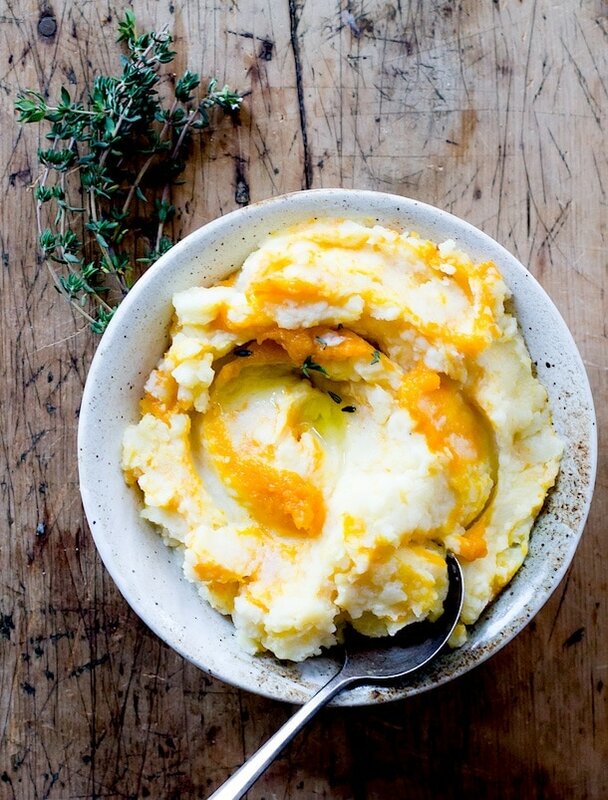 What a great idea to add pumpkin to mashed potatoes! Love this! I love that you not only added pumpkin, but fresh thyme–this is just great! Virtual pumpkin party? Yes, please! I could eat pumpkin AND squash all day everyday so I love the idea of these pumpkin mashed potatoes. These would be the perfect side dish for Thanksgiving. Dear Amanda, what a gorgeous dish! Love the swirling of the two, truly a work of art. And thyme. I’d not heard of squash snobbery before. Glad to be in the know. :) Your blog is absolutely beautiful, I loved visiting. These photos are beautiful Amanda! I absolutely love that you swirled the pumpkin and potatoes together. What a showstopping Thanksgiving side dish this will be! Holy moly. What a creative and hearty combo. It’s like mashed potatoes on fall steroids! I love the combo of herbs and spices. Can’t WAIT to make this! I’ve loved seeing all the virtual pumpkin party recipes! This recipe is one of my favorites so far. Pumpkin swirled mashed taters sound amazing. This is such a creative side dish – love the sound of all those earthy herbs you’ve used too. Mmmmm, this looks SO good. Such a pretty contrast of colors of flavors. What a perfect description of Sara. I completely agree! I was so thrilled to be included in this pumpkin party. Your recipe blew me away. Swirling pumpkin into your potatoes…genius! The thyme addition is the perfect pairing. YUM! These look incredible! I may try a dairy-free version so I can eat them, maybe with coconut or cashew milk instead of buttermilk :) Yum! hi! i’ve made with unsweetened almond milk and it works great! and ghee instead of butter, to make them dairy-free. Ooooh girl I think you just went ahead and redefined the quintessential Thanksgiving side-dish. Brava—these are absolutely perfect. So excited to make them myself! can thanksgiving come soon enough? favorite holiday of the year, hands down. because the food just can’t be beat! I love where your head was at with this one. Super beautiful, super creative. LOVE, xxxxxx!!! This looks so comforting, like I’d want to slide into the bowl! What a great combo, I want to try this… I have so much pumpkin puree begging to be used :) Lovely, Amanda! Pumpkin, potatoes, buttermilk and butter? That sounds amazing. I can’t wait to put this together for Christmas dinner. Love this! Will make it. How about adding a drizzle of maple syrup to the pumpkin? hi Naomy! i think the maple syrup might compete with the garlic and thyme in the pumpkin. have a great thanksgiving! Honestly, you’ve shared some really scrumptious recipes here and oh my gosh, I just want ALL of them. I’m totally drooling over here! 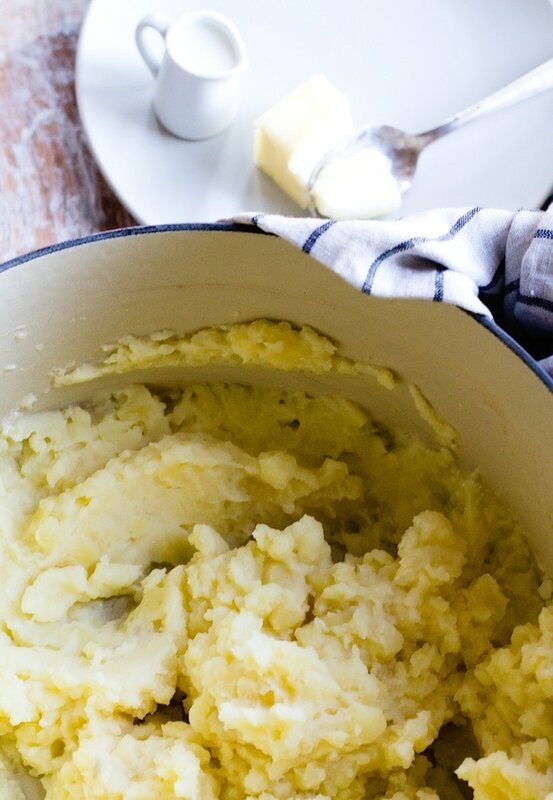 Honestly, you’ve shared a really scrumptious mashed potatoes recipe here and oh my gosh I’m totally drooling over it right now!